ATHENS—Europe’s ultimatum to Greece, demanding full capitulation as the price of any new bailout, marks the failure of a rebellion by a small, debt-ridden country against its lenders’ austerity policies, after Germany flexed its muscles and offered Athens a choice between obeisance or destruction. The other 18 euro members were late Sunday pushing Greece to implement all of the austerity measures and broader economic overhauls its voters have twice rejected—in elections in January and in a referendum on July 5—not in return for new rescue loans, but as a precondition for even talking about them. The Greek government of left-wing Prime Minister Alexis Tsipras,which has spent all year trying to challenge Europe’s bailout policies, has ended up a near-powerless pariah in Europe—even though Mr. Tsipras is politically dominant inside Greece. Its only remaining option for disobedience—to default and leave the euro—would satisfy rather than horrify many of its European critics, led by German Finance Minister Wolfgang Schäuble. The fall of the Tsipras government under the creditors’ heavy pressure would please many European policy makers. In Berlin and other northern European capitals, officials have made little secret of their view they can’t trust Mr. Tsipras to deliver his side of a bailout deal, even if he were to sign one. But most officials know that Mr. Tsipras’s fall after only six months would raise awkward questions about the scope for democracy in an EU that presents itself as a beacon of popular sovereignty for the world. Greece hasn’t complied with creditors’ demands yet. But its only alternative appears to be the gamble of a euro exit, which most Greeks fear would bring worse economic devastation. In the end, the telling factor in the standoff may be that Greeks fear their country’s exit from the euro more than Germany does. That gives Berlin the stronger hand to impose its austerity-and-reforms prescription. 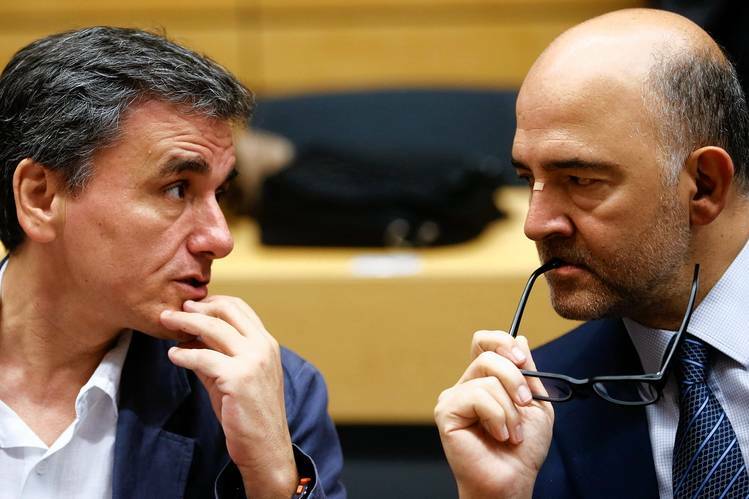 The demands from the so-called “Eurogroup” of finance ministers range from handing Greek public assets to a fund in Luxembourg to auction off to giving international technocrats powers to approve or veto draft laws in Athens. “The Eurogroup is pushing Tsipras to effectively hand over the keys to the country; he may have neither the will nor the authority to do so, opting to walk out and resign instead,”Wolf Piccoli, managing director of political-risk consultancy Teneo Intelligence, wrote in a research note Sunday. Behind Europe’s show of force lie three main factors: Fury at Mr. Tsipras’s delay tactics, shock at the rising cost of any and all Greek scenarios, and a worsening clash between German-led Europe and the IMF. Since his election in January, Mr. Tsipras has oscillated between his hard-line and pragmatic advisers, Greek officials say. The pragmatists urged him to sign a bailout deal early, even if it meant accepting politically hard-to-sell austerity measures, because the terms of any deal would get tougher as the months passed and Greece’s economy deteriorated. Nonsense, argued others such as now-ousted finance minister Yanis Varoufakis: Greece would get the best bailout terms, including less austerity and more debt relief, if it waited until the last moment before debt default. Europe would get scared of the destabilizing fallout from a Greek euro exit, this camp argued. Mr. Tsipras went with the second school of thought, figuring also that his left-wing Syriza party would only swallow a bailout deal involving austerity if the alternative were imminent economic meltdown. For months, Mr. Tsipras saw to it that Europe’s normal channels for negotiating bailout terms—the Eurogroup, and teams of EU-IMF inspectors—were paralyzed. He instead bet on face-to-face talks with German Chancellor Angela Merkel, believing that she would make a fundamentally political decision to keep Europe united, even at the expense of German economic orthodoxy. It proved an epic miscalculation. Backed into a corner by Mr. Tsipras’s referendum, in which Greeks overwhelmingly rejected their creditors’ austerity demands, Ms. Merkel hardened her line. A deal with Athens that let Greece off tough economic reforms would be worse for Europe and splintering the eurozone, she argued. Ms. Merkel’s openness to Greek euro exit—an outcome she had previously resisted as too hard to calculate or control—has allowed her finance chief, Mr. Schäuble, free rein. Long convinced that Greek politicians simply aren’t up to running their country well enough to be a euro member, Mr. Schäuble stunned Greece on Saturday by proposing that the country take a five-year “timeout” from the common currency. Official Europe, it appears—at least this weekend—can play chicken better than Mr. Tsipras. Germany, once provoked, has proved more willing than Mr. Tsipras expected to contemplate a Greek euro exit, or “Grexit.” That makes the eurozone’s German-inspired ultimatum more credible than Syriza’s implicit threat of euro exit—which Mr. Tsipras knows his nation overwhelmingly fears. Yet the weekend’s unequal test of strength in Brussels can’t be counted as a simple victory for Germany and its eurozone allies. Ms. Merkel wanted to lend Greece money while it overhauled itself, and to get the money back in a reasonable time. Now the cost of keeping Greece afloat in the euro is reaching a multiple of what Ms. Merkel originally expected. Not only does Greece need as much as €86 billion more in financing, but the European part of the roughly €216 billion in funding that Greece has received so far needs restructuring. Regardless of whether the German stance prevails, Ms. Merkel also faces one of the deepest political crises of her decadelong tenure. Her coalition partner, the left-of-center Social Democrats, has criticized her for being prepared to kick Greece out of the euro. Meanwhile, many of her conservatives are balking at any further aid for Greece at all. How much restructuring is the subject of tug of war between the IMF and German-led Europe. The IMF insists that comprehensive debt relief is needed to make Greece solvent again, such is the damage that the recent weeks’ events have done to the country’s economy and banking system. The Germans insist outright debt forgiveness is unacceptable to them and illegal among EU nations. The IMF says that the less debt relief Greece gets from Europe, the harsher the terms of Greece’s overhauls-and-austerity program have to be. Greek taxpayers have to carry the full cost of repairing the country’s solvency if Germany and the rest of the eurozone won’t. 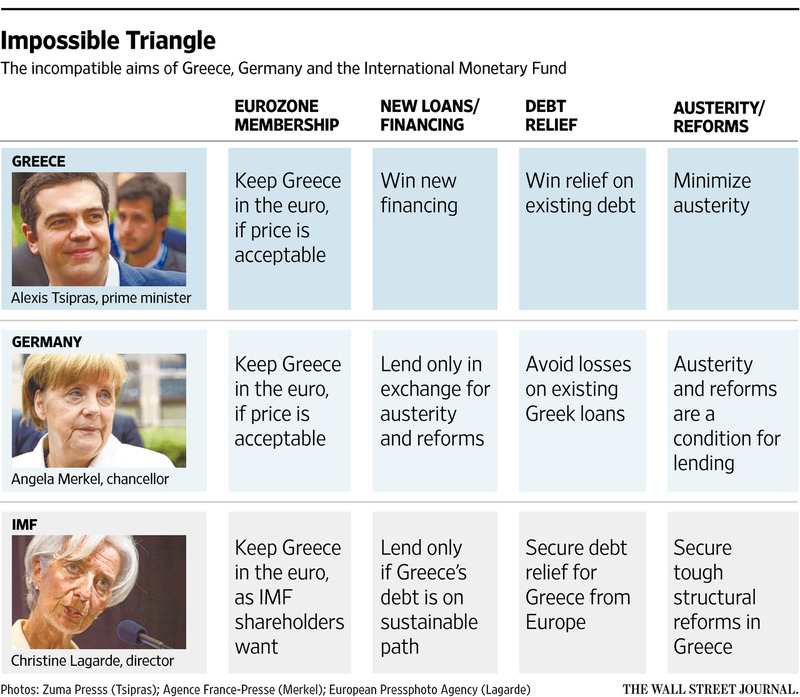 Ms. Merkel needs to keep the IMF on board to sell further aid for Greece to her increasingly skeptical parliament. That—as well as her finance minister’s anger at Greek politicians—is why the chancellor is now tightening the screws on Mr. Tsipras.